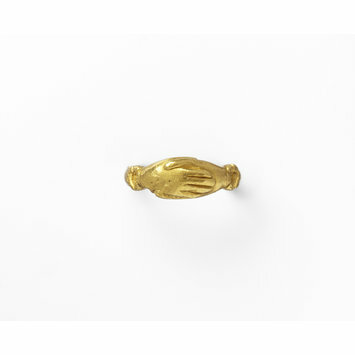 The fede ring traditionally has the motif of two right hands, one female and the other male, clasped together or holding a heart between them. The word ‘fede’ comes from the Italian ‘mani in fede’ meaning ‘hands in faith’. The fede ring dates back through antiquity and was popular during the Renaissance when it was given as a symbol of betrothal. It was popular throughout all the Middle Ages across all of Europe as a symbol of love and has continued to be worn in different forms to this day. Fede rings would very often be inscribed, usually in Latin or the local language. Their popularity ceased by the end of the 19th century. 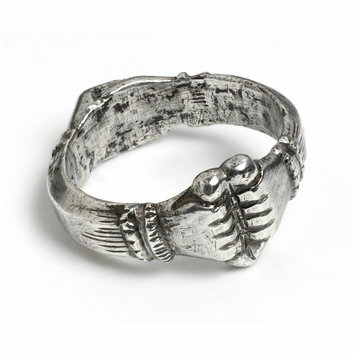 This ring combines two traditional motifs. On this side you see the clasped hands, on the other side you see the two hands holding a heart. 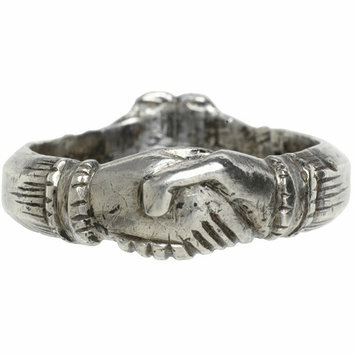 This ring combines two traditional motifs. On this side you see the two hands holding a heart, on the other side you see the clasped hands. 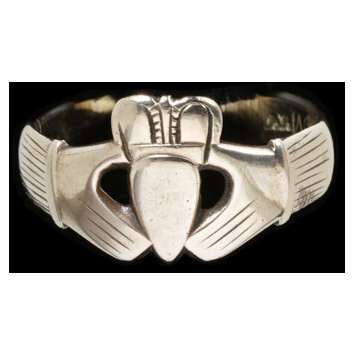 The Claddagh ring is the traditional Irish version of the ‘fede ring’. The distinguishing motif is of two hands clasping a heart, usually topped with a crown, although not always. It has been created in its current form since the 17th century and is still popular today. It is worth noting that a very similar motif was also used in England the early 18th century. The Claddagh ring has come to be a symbol for Irish culture pride as well as a traditional symbol for love, betrothal and marriage. Yet are they both each other’s counterpart. 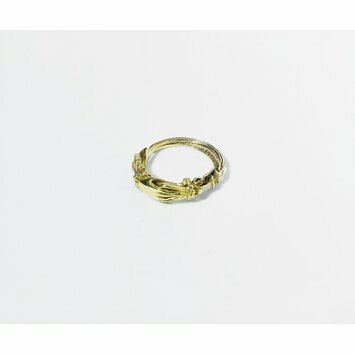 A gimmel ring (or ‘gimmal’ ring) is designed with two or more bands joined together with a tiny pin that acts as a pivot; the bands swivel and align to create one ring when worn. This symbolizes the union of two people. ‘Gimmel’ is derived from the Latin ‘gemellus’, meaning twin. There are quite a few references to ‘gimmel’ type rings in literature, including Shakespeare who referred to them as ‘joint rings’. These rings were nearly always wedding or engagement rings. Sometimes worn separately, one part was worn by each of the couple until their wedding, when the ring was then worn as one on the bride’s hand. 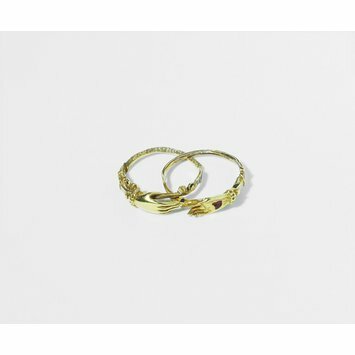 When there were a triple link rings, a third person was assigned to witness the couple’s vows and would hold the third part of the ring until the marriage. 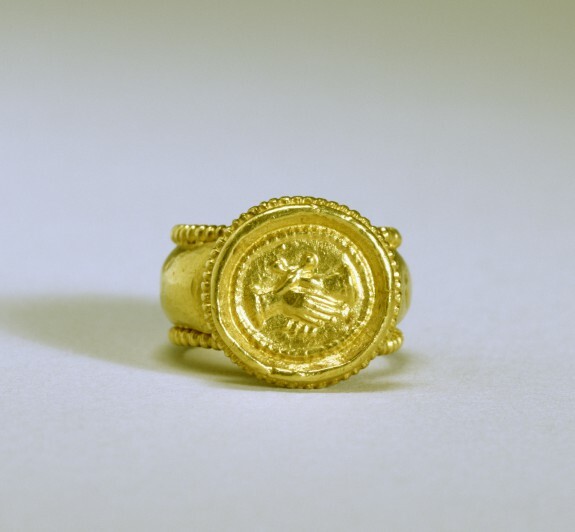 Gimmel rings were also given as tokens of friendship between men. Sometimes, gimmel rings would be set with gemstones. There were even very rare variations, which are nowadays considered the most valuable, with momento mori figures such as babies or skeletons or other sculptural details, hidden beneath the stones or in a small cavity in the bezel. In later versions, a Cupid’s bow or a quiver of arrows or a tiny pair of hearts were the more popular choices for hidden figures. 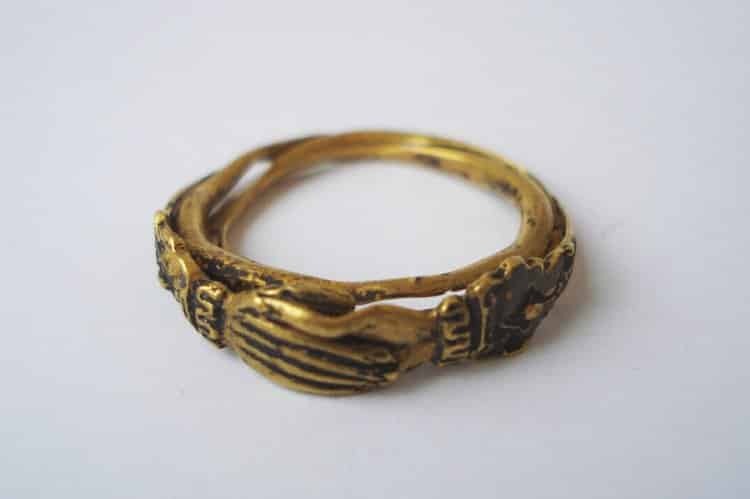 By the late 18th century, gimmel rings had become more elaborate, with shanks of 5 or even more, sometimes connected at the back by a pivot, so they hinged like a fan. Gimmel rings were usually combined with the fede hand motif but, by the end of the 18th century, lover’s knots also started to be incorporated, sometimes with enamel work. Other later motifs incorporated were turtle doves, pairs of interlocking hearts, ivy, forget-me-knots or butterflies. By the end of the eighteenth century, Biblical quotations were rarely found engraved on the inside, instead there were generally the names of the couple to be joined in marriage. 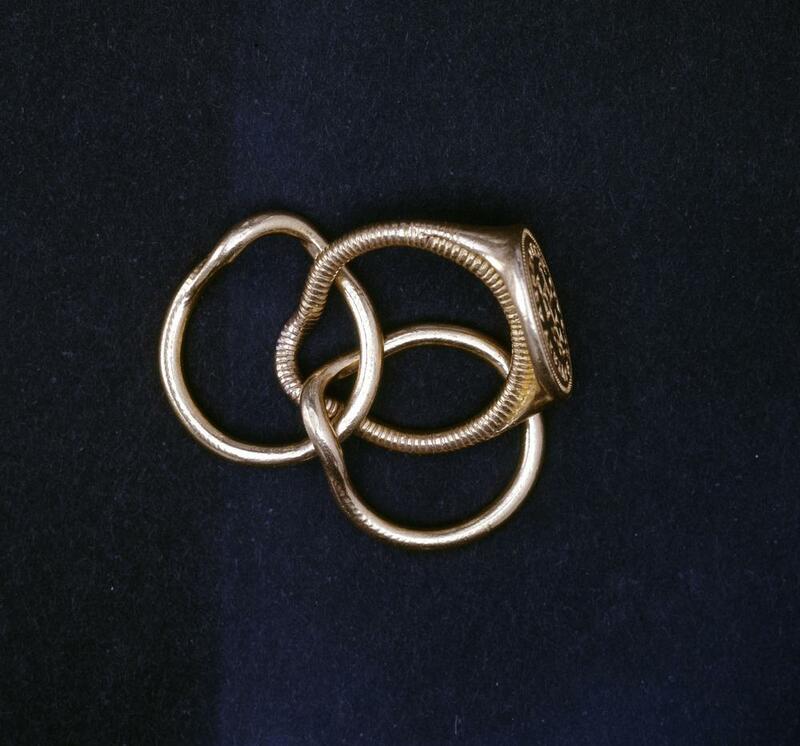 Puzzle rings probably evolved from gimmel rings and date from as far back as the Renaissance period, although it is possible that they have Celtic roots. They are made up of interconnected rings. Most come from England or Italy and seemed to emerge during the seventeenth century. Craftsmen added additional hoops to the traditional gimmel ring so that some of these gimmel rings had as many as a dozen shanks. They then created interlocking bezels and more complex designs. Some of them were very challenging to return to a single band once the interlocking hoops had been taken apart. In some cases, the hoops were shaped so that they fitted together almost like a pretzel. In other cases, they were a woven band. In other cases, the bezel would contain a design that could only be seen when the ring was reassembled in a particular order. Most puzzle rings had between three to seven hoops. Sometimes, puzzle rings would also have the ‘fede’ motif. They are also sometimes referred to as ‘Turkish Wedding Rings’ or ‘Harem Rings’. However, there is no evidence of Turkish people wearing them and the chances are this was simply a West European marketing invention. 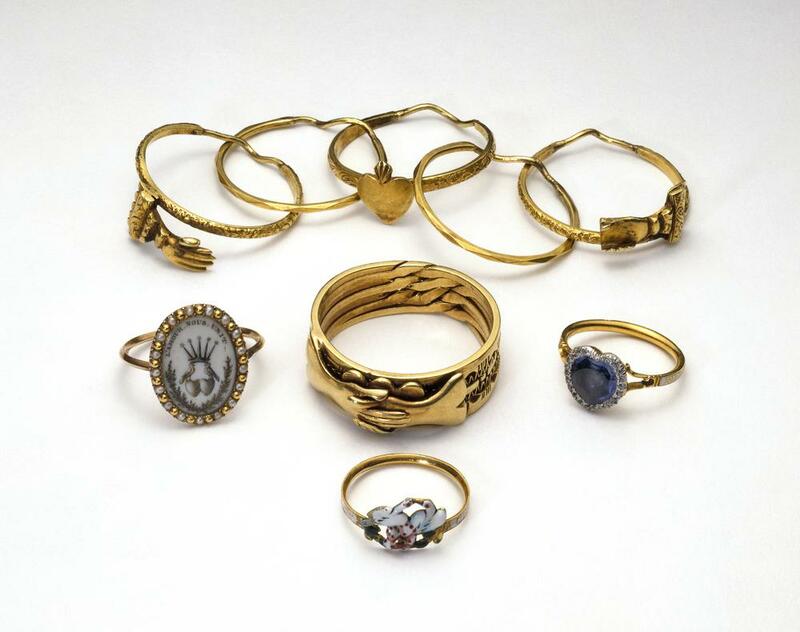 There was a story told in connection to puzzle rings that a Turkish nobleman invented them in order to keep his wife faithful (perhaps by keeping her busy and distracted trying to work out the ring.) They were not, however, traditionally used for betrothal or weddings or love tokens. Puzzle rings are still very popular today, although the designs are usually more standardized. The top and the center rings are gold puzzle ring, both with fede motifs. 18th century.